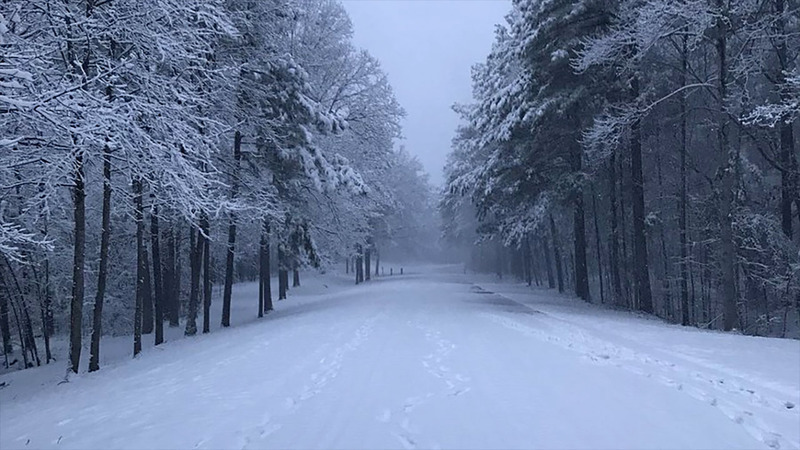 Many cities and municipalities are operating on revamped schedules because of the snow that dumped across the region Thursday. Here is what we know about garbage collections, city services and other similar activities affected by the snowstorm. For school closings and delays click here. For a full list of reported business and church closings and delays, click here. For more on roads and public transit, click here. For real-time updates from ABC11 social media, click here. Wake County Court sessions will be delayed Friday and will begin at 11 a.m. The City of Raleigh Solid Waste Services Department will operate on a two-hour delay Friday. Crews will resume service at 9 a.m., starting with Wednesday's routes and then moving to today's routes. If all routes are not serviced on Friday, residents are asked to leave their trash and recycling carts at the curb for collection on Saturday. Friday's routes will be collected on Saturday. Crews will resume collection on Monday until all routes are completed. Yard waste collection is suspended for the remainder of the week. City of Raleigh Parks, Recreation and Cultural Resources Department facilities are reopening Friday. Weather-bound and Track-out sites operated by the department start at 9 a.m. The Weather-bound sites are at Jaycee, Green Road, Chavis and Abbotts Creek community centers. Track-out sites are Marsh Creek, Lake Lynn, Brier Creek and Barwell Road community centers. All other parks facilities will open at their normal time on Friday. Lake Wheeler is closed due to storm damage. The Town of Garner will operate on a two-hour delay on Friday. All-Star Waste plans to resume service Friday morning. It will start with Wednesday routes and try to catch up. It might need until Saturday or later to get entirely caught up. The County's four Solid Waste and Recycling Convenience Sites operated by Durham County General Services will open at 11 a.m. on January 19th. Durham County residents with a current 2017-2018 solid waste decal can resume disposal of garbage, recycling, yard waste and bulky items once the sites open. Durham County Roadside Recycling Collection will operate on delay on Friday, January 19th. Collection is behind this week due to inclement weather. Tomorrow's collection will be completed for customers normally scheduled to receive roadside services on Thursdays. Those customers should ready their items for collection at the curb. Roadside collection for customers whom normally receive services on Fridays will be determined based on the review of road conditions tomorrow. Because the Durham County Government offices open at 11 a.m. Friday, Welcome Baby will not have its morning Giving Closet session. Welcome Baby will receive families for the afternoon session beginning at 1p.m. County employees who live in neighborhoods that remain impassable should consider their personal safety before heading out. If there are extenuating circumstances, contact your supervisor to consider alternate work options. Solid Waste is not expecting any delays for Friday's pickup. There are still a small number of flight delays; please check with your airline or log onto www.flyfay.com. Based on the latest weather forecast and conversations with Emergency Management staff, Fayetteville-Cumberland Parks & Recreation will close all facilities Thursday at 6 p.m. Friday's early morning programming will be delayed, with Senior, Gilmore, Tokay, Kiwanis and Westover recreation centers opening Friday at 10 a.m. All other operations will follow normal schedules unless otherwise directed via the City Manager. The Citizens Participation Meeting scheduled for this evening at Mount Olive Missionary Baptist Church has been canceled. The public is invited to attend the next two upcoming meetings on Jan. 23 at Hollywood Heights Community Center, 691 Pritchett Road; and Jan. 30 at Old Wilmington Road Neighborhood Resource Center, 229 Lincoln Drive. All meetings start at 7 p.m.
Chatham County closed the temporary shelter in Pittsboro at 2 p.m. Thursday, when the last people housed there were able to leave. County Manager Renee Paschal has announced that county offices will reopen Friday at 11 a.m. but be aware that some offices may have limited services. Residents are advised to call in advance. Courts are cancelled again on Friday, but the Clerk of Superior Court will open at 11 a.m. Call other court offices in advance to see if they are available. Johnston County Government offices will open at 10:30 a.m. on Friday, January. All non-emergency Town of Benson facilities will be on a delayed start for Friday. Weather permitting, doors will open at noon and remain open until 5 p.m.
Orange County Government will operate on a three-hour delay Friday. Most offices and services will open at 11 a.m. The county said it has taken great steps to clear the parking lots and entrances to county facilities, but icy patches could remain. Residents are asked to use caution when entering and exiting county facilities. Curbside recycling collections will be running Friday and Saturday to make up Wednesday, Thursday and Friday routes, as conditions allow. Some side roads may continue to be inaccessible through the thawing and freezing period. If you are on these routes and your recycling remains uncollected, please leave your recycling at the curb (but not in the street) so that our drivers can continue to make up in the early part of next week. For this collection cycle, curbside recycling collection staff will pick up excess material left outside the carts in rigid containers such as plastic crates, or a laundry basket. Do not use plastic bags. Please make sure that your recycling is not blocked by cars or any other obstruction. The Town of Hillsborough says that if they are able to do so, citizens on Wednesday, Thursday and Friday routes may place rollout trash carts at the street for collection. Please place the carts where they do not interfere with plowing. Public Works crews will collect garbage as soon as road conditions permit and possibly on Saturday. Collection of bulk items for those routes will be completed next week. Brush and loose leaf collections for Hillsborough residents will resume next week. Orange County will reassess schedules for collecting recyclables once road conditions improve. See the county's website at www.orangecountync.gov for updates on recycling pickup. Hillsborough town offices will open at 1 p.m. Friday. Opening times for some offices may be affected by the ability of personnel to get to work. Citizens needing to conduct business with the town are encouraged to call or send an email in advance. Hillsborough's greenways, including Riverwalk, will not be shoveled. Citizens choosing to use the town's greenways and parks do so at their own risk. City of Burlington offices will be operate on a regular schedule 1/19/18. Garbage collection had been modified due to the hazardous road conditions. Sanitation department has coordinated with the Street Division to gain the ability to travel along the routes below. Maynard Aquatics Center will delay opening until noon Friday.